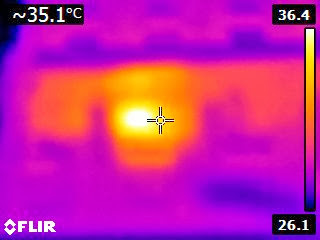 I purchased one of the new FLIR E4 thermal imaging cameras (TIC) a couple weeks back because I am working on a new project called Motobrain. It is an automotive power distribution unit with a nominal current capacity of 100A. For those not in the know, 100A is a TON of current! Because this project is designed to move so much current and will be small I need to understand its thermal characteristics very well. To that end I've been operating the device and taking measurements. What I found is that I just could not get the kind of detail I wanted. 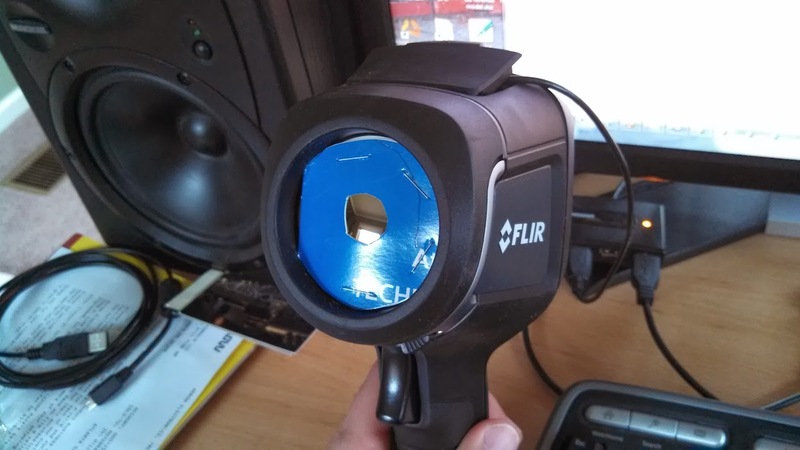 The reason is that the resolution of the microbolometer in the FLIR E4 is not very high and the lens does not allow you to get very close to the device under test (DUT). The means that you cannot just zoom in after you take a photo either. So, what is a person to do if they want to take a macro photograph with a consumer grade TIC? Go to Amazon.com of course! 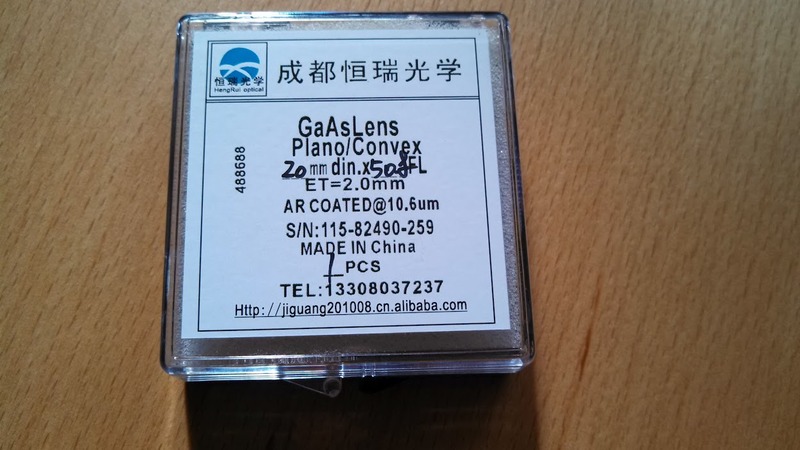 I purchased a Gallium Arsenide (GaAs) lens meant for a CO² laser for about $40 and waited patiently for it to arrive (via ox cart it would seem, it took weeks) from China. Then I mounted it up in a highly technical lens mount (a paper CD case cut with scissors and stapled together with the lens inside). This provides me a focus distance of about 2 inches which is great for close up work on a PCB. Different lens sizes will provide different focusing distances. I chose a 50.8mm lens. The photo on the left is with the new macro lens attached. The photo on the right shows the previous closest in focus image I could make. 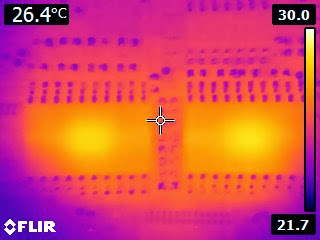 Both photos are looking at the same part of the PCB. My lens mount is causing some vignetting which I can fix if I want to bother to make a nicer lens mount on the laser cutter. Honestly I am quite satisfied with the current image quality. If it ain't broke, don't fix it. 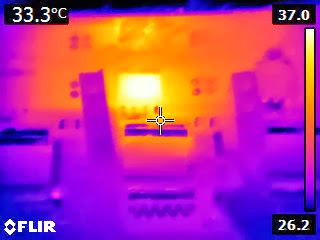 The photo on the left shows an SO-8 PowerPak MOSFET glowing nice and warm. You can even see its drain and gate pins. The photo on the right is the same image from the same distance without the lens installed which shows you what it looks like out of focus. This is a significant improvement at a trivial expense compared to the cost of the instrument. 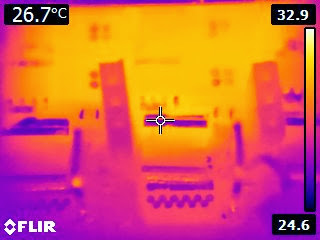 This final image shows the same portion of the PCB as above only with the current flow having just been removed. 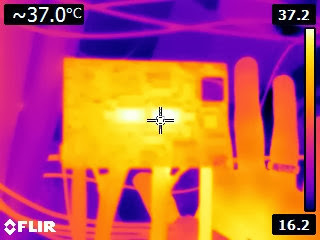 You can see clearly the temperature gradient as we get further from the MOSFET. Neato! Special thanks to Mike for the inspiration to do this hack.